Stroke of the pen. Law of the Land. Kinda cool? Totalitarian wannabe oath breaker Kate Brown channels her inner PaulBegala to subvert the true "supreme Law of the Land." 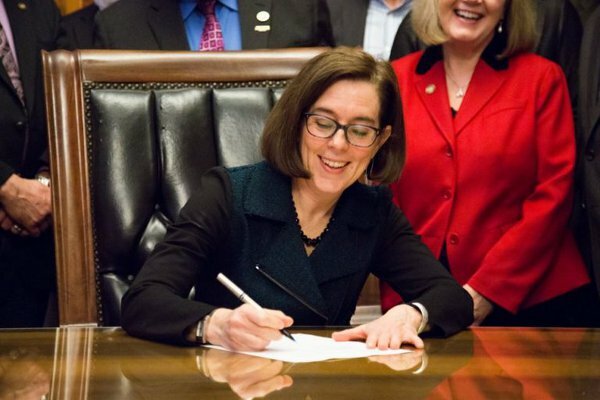 Secure in a position won with substantial financial support from Michael Bloomberg, Oregon Governor Kate Brown has kicked off 2017 by adding to gun owner control priorities announced last year as goals. In July, Brown outlined plans to, among other legislative objectives, "strengthen ... tools to track and analyze gun transactions," to "study" and "report" on "domestic" and "gun violence" for the purpose of offering new policies, and to work with the legislature to enact three priorities: Deny firearm transfers to anyone authorities take longer than three days to approve (the so-called "Charleston loophole"); expand relationships that qualify for due process-denying "domestic violence" gun prohibitions (the so-called "boyfriend loophole"); and ban standard capacity magazines (the should-be-called "freedom loophole"). Those are just what she proposed to begin working on - her further desires, announced at a press conference under the armed protection of police outnumbering reporters - include for "Congress to ban assault weapons [sic] and strengthen anti-terrorist legislation by passing the common sense 'No Fly, No Buy' ban." Along with that bill, two other efforts meriting scrutiny have been announced for introduction when the legislature reconvenes in February: a bill to have dealers accept and store guns owned by people with mental issues (and how a family member could take it from the owner without making that an illegal transfer is unclear), and a bill requiring gun dealers to display and provide "educational" suicide prevention materials, which, per OFF, must include "Multiple versions ... to reflect the different local values and cultures within this state."